All of them have been repotted twice now because of how fast they are growing. They are my favorite plants in my garden right now. Crab Grass will not require any maintenance at all to get it to grow. Crab Grass--Digitaria sanguinalis. Crabgrass, sometimes called finger grass, is a prolific grass that multiplies and thrives in areas such as lawns, golf courses, and other sports fields, as well as in pastures. It can reach heights of up to two feet, but is quite adaptable to mowing height, and will tolerate high temperatures and dry conditions. Crabgrass was introduced to the US as a forage plant, and its perseverance and rapid growth rate make it ideal in some areas as summer forage for livestock. A summer annual, crabgrass reproduces through seeds. Crab Grass seeds germinate from early spring to late summer. It is a mat-forming grass, developing from a rosette, roughly resembling a crab. Purplish seed heads provide seeds until the first hard frost kills them. Hairy crabgrass has leaves that are fuzzy, and grow between two to six inches in length. Low-growing smooth crabgrass does not have hairs on the leaves or sheaths. A coarse-textured, yellowish-green grass, crabgrass not only propagates through reseeding, but hairy crabgrass also propagates through runners. It helps prevent erosion in areas with sandy soil that is prone to blowing away. Crab Grass is excellent to use to prevent soil erosion. Crab Grass plants are monocotyledonous (i.e., flowering plants with a single seed leaf) annual lawn, pasture and forage plants. These plants are tasty food for cows, horses, and sheep. There are different types of crabgrass (long, leaves are purple and short or smooth) plants that grow from the late spring to the early fall seasons with grass fertilizers and mulch or topsoil. It is essential to calculate the square footage of the area where the seeds will be scattered when planting to know how much seeds are needed before planting crabgrass seeds. Plant in leveled loosen, moisture soil (soil tiller) to prevent over watering. 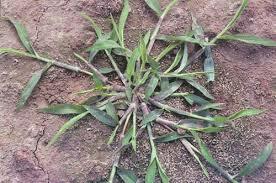 Crabgrass plants do well in the dry ground and can be reseeded. Its deep root system penetrates the ground and helps keep soil in place. This grass will take over large areas where nothing else seems to grow.